Posted on September 13, 2016 by Barry V.
Sampson’s Island is my first sanctuary visit that requires a BOAT. I meet two coastal waterbird wardens at a rendezvous point in Cotuit, and load my field kit into a small, open runabout. Brad Bower is the Sampson’s Island “crew leader”, and his associate is Brian Lonabocker. They are students of biology and environmental science, and this is a summer job for them. Today, they load signs into the boat, which they’ll be posting in various spots around the island. During the peak breeding season, boats are not allowed to land on the island, in order to safeguard the birds during this critical period. During the ride over to the island, Brad fills me in on the latest news regarding the breeding birds of Sampson’s Island. 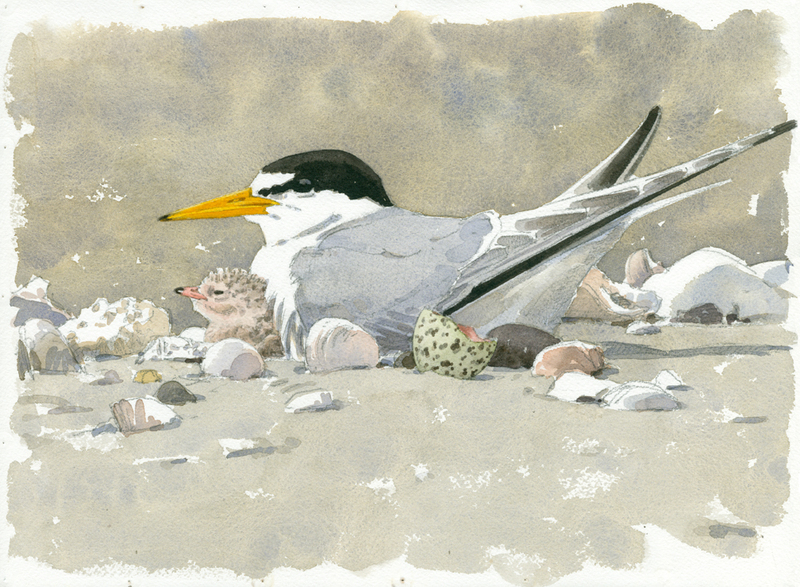 He calculates there are between 30 and 40 pairs of least terns nesting on the island, and remarks that some of the tern eggs are just starting to hatch. 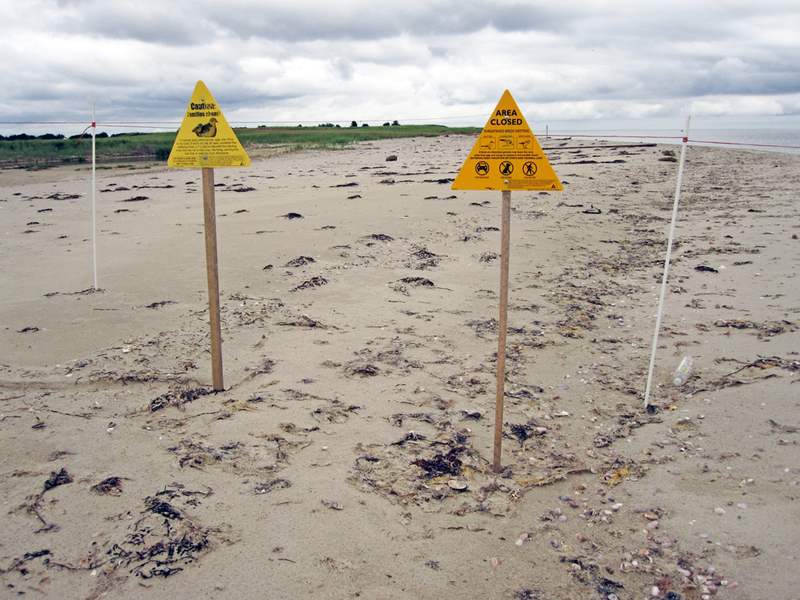 This season, seven pairs of piping plovers have also established nests, with six young fledged so far from two nests. Many nests of both species have failed for various reasons. Overwash from storm tides has been a factor, as well as predation by crows, a coyote and other unidentified culprits. So far, less than half of all nests have produced fledglings. For coastal waterbirds, raising a family is a hit-or-miss proposition. As I’m watching one sitting bird, I notice an eggshell near the nest, and suspect that a chick has recently hatched. The adult bird is abit restless, shifting and resettling on the nest. Next, I see a tiny bill poke out from beneath the adult’s wing, then a small, fluffy head! 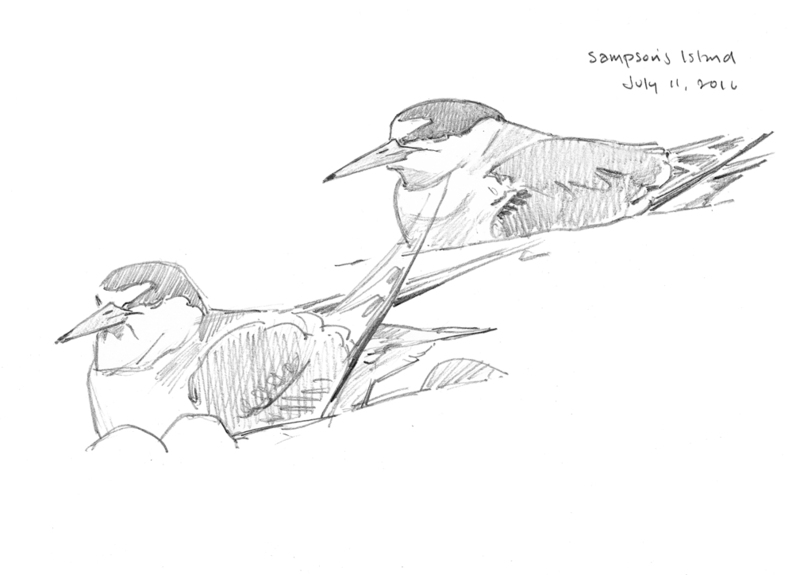 The adult bird’s mate arrives with a tiny minnow, and both adults stand on either side of the nestling, prodding it to take the food, which it finally consumes with a gulp. 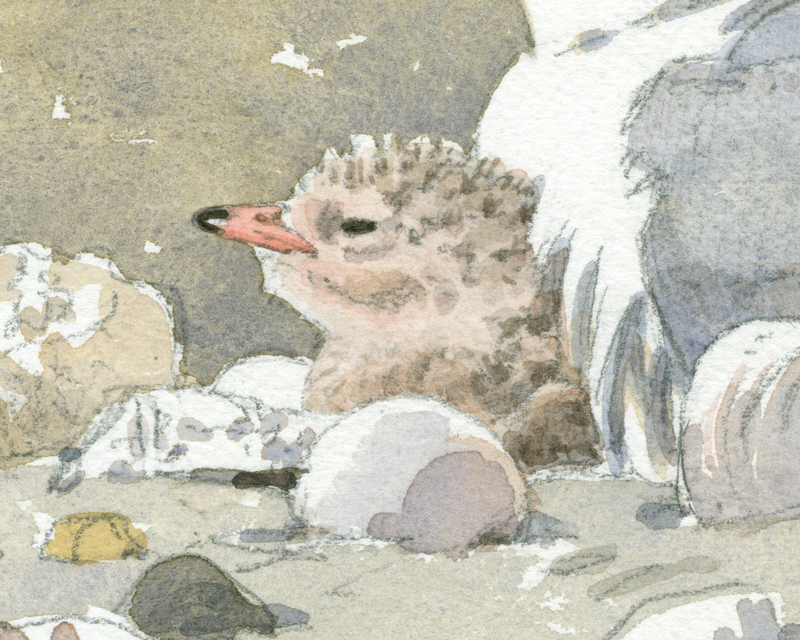 I modify the drawing I’ve been making to include both the eggshell and the chick! A drawing from life, unlike a photograph, can be a composite of many moments. 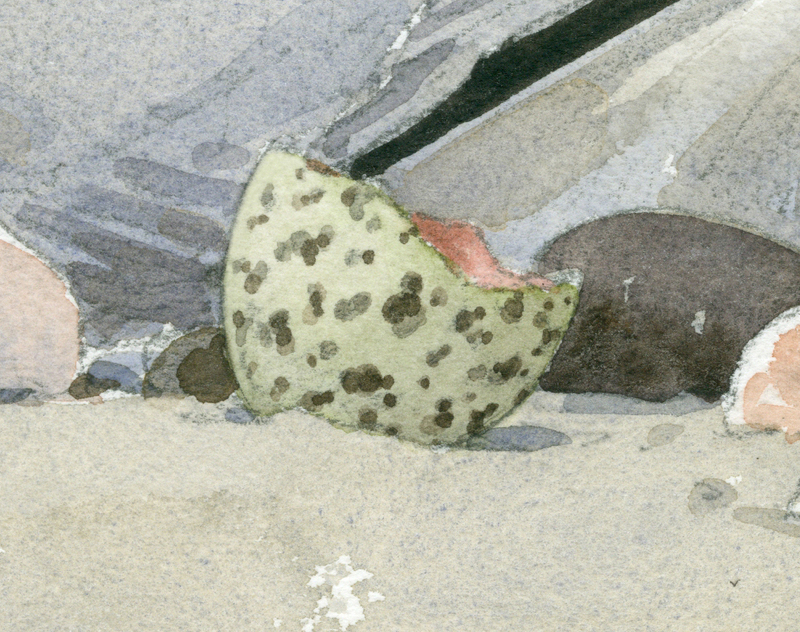 There were two piping plover nests on this part of the island, but the eggs hatched weeks ago. 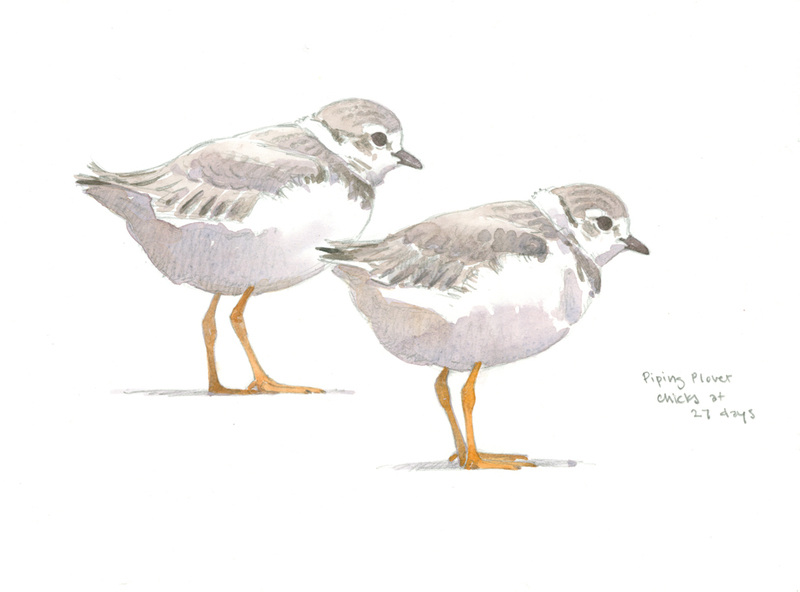 Now, the young birds can be seen foraging around a small salt pond behind the beach. The parent birds are nearby and vigilant. Several times I watch them chase off an intruding plover. The pale, plump chicks are in constant motion, and difficult to follow with the scope. They are nearly as large as the adults, but have puffy white collars around the back of the neck, and none of the crisp, strong markings they will sport as adult birds. Brad tells me they are 27 days old. 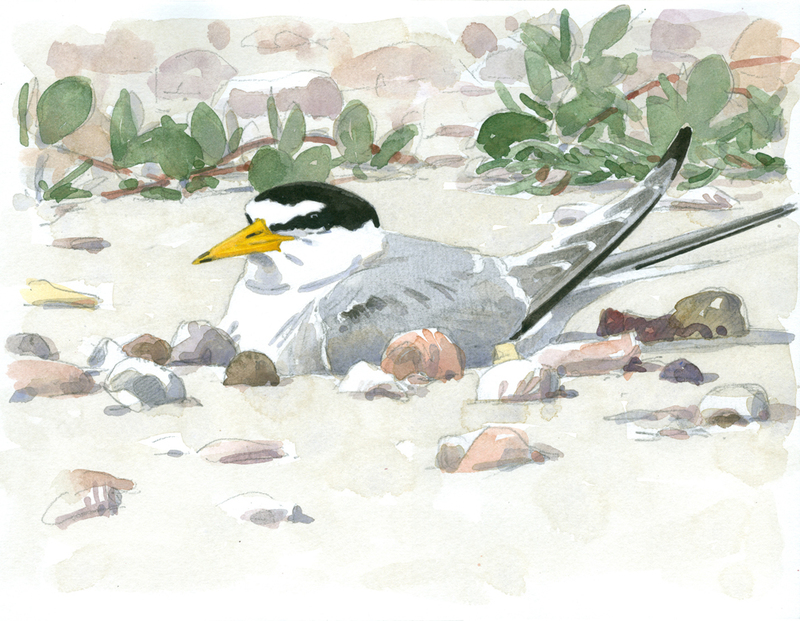 This entry was posted in Artists, Barry Van Dusen Residency, News and tagged Baby birds, Cotuit, Island, least terns, Mass Audubon, Piping plovers, predation, Sampsons Island Wildlife Sanctuary, tern eggs, Wildlife Sanctuary on September 13, 2016 by Barry V..